Sensual and rich, with top notes of magnolia in full bloom underpinned by green middle notes of fresh bay leaves, our Magnolia & Bay Diffuser infuses your home with a luxurious and enriching scent, exuding a sense of peace and sophistication. The scent of bay leaves delivers a curious and complex fragrance, equal parts herbal and floral. This aromatic medley provides a sensual base note that’s warm, familiar and comforting, making the Magnolia & Bay Diffuser a great choice for the kitchen, lounge or dining area. Garnishing this subtle herbal fragrance is the sweet, floral bouquet of magnolia. Like bay leaf, magnolia is complex and difficult to pin down, being both musky and floral. In Asian cultures, magnolia extract has long been used to treat anxiety, ease tension and promote healthy sleep, so magnolia-scented diffusers are a great choice for creating a relaxed and tranquil ambience in the home. Our luxury Magnolia & Bay Diffuser is one of the carefully-paired scents in our Fine Fragrance collection, a selection of classic scent combinations that offer outstanding long-lasting fragrance in both natural wax and reed diffuser form. 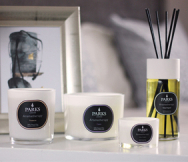 All our luxury reed diffusers comprise a bottle of slow-evaporating essential oil, whose scent is delivered via a handful of quality natural rattan sticks. The Fine Fragrance diffuser range conveys pure scent for up to 8 weeks, creating the ideal fragrant accompaniment to any room. Wrapped up in a luxury presentation box, our Magnolia & Bay Diffuser could be just the gift for that special someone in your life.